Pulp Hack Confessions: Make Book on It! Original Release Date, 1976; Director's cut 1978. If cynicism and ambivalence are the keynotes of classic film noir, The Killing of a Chinese Bookie has both in spades. Cosmo Vitelli, the lead character (Ben Gazzara), seems to alternate between shallow self-absorption and warm generosity. At times he seems cowardly and spineless, given to panic; at key moments, however, he has more brass than the ring dispenser on a carnival carousel, coupled with a grimly equivocal attitude about his own fate that makes him truly dangerous. The "numbers" performed by Vittelli's dancers and master of ceremonies, the bizarre "Mr. Sophistication" (Meade Roberts) are a joke, but not the type that most audiences would find entertaining: the girls move about the stage listlessly, randomly shaking their stuff while the MC sings pop standards in a tuneless quaver and Cosmo, wearing a smile as synthetic as a cheap toupee, frets from the wings. 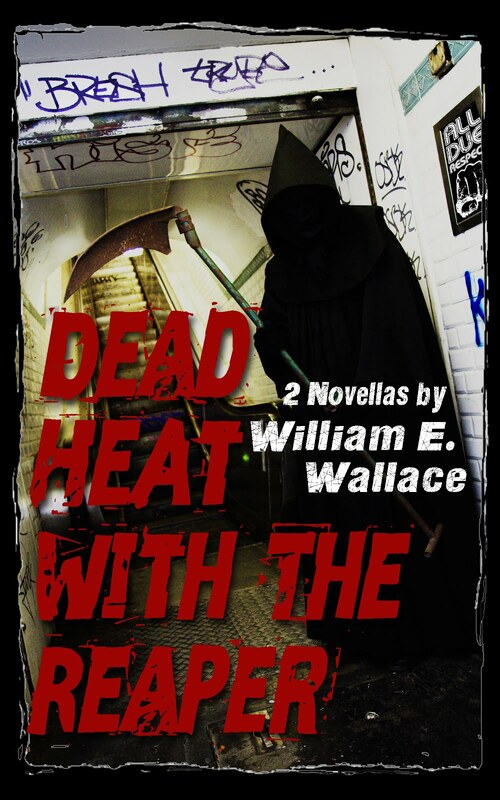 The joint is portrayed as a sort of cinderblock hades, staffed by half-wits, choked with cigarette smoke and illuminated by badly placed, low-watt light bulbs with the occasional ray of sunshine piercing cracks in the wall or a peeling painted-over window like the blade of a stiletto. 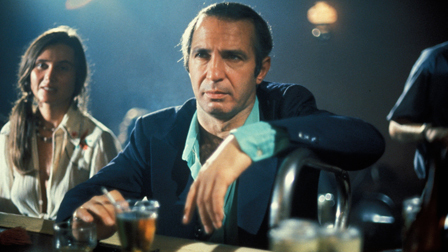 Ben Gazzara in a pensive moment during The Killing of a Chinese Bookie. The interior scenes -- not only at the Crazy Horse West, but also in a warehouse where Cosmo evades murder at the hands of Mafia goons -- seem to close in around him claustrophobically, much as the darkness does in the nighttime exterior shots. The overall effect is suffocating, like being trussed in a sleeping bag by kidnappers and tossed into the trunk of a getaway car. By contrast, the daytime streets of Los Angeles outside are as garishly overlighted and unnatural as Crazy Horse West is dim and airless. Both exude an artificiality that almost seems a metaphor for Cosmo's life. You see, Cosmo as a businessman and individual is as big a sham as his club. He clearly considers himself a big wheel: "I've got a golden life," he tells a woman in a bar who asks him what he's staring at. "Got the world by the balls. That's right, I'm great . . . I am amazing." But in fact, he is a degenerate gambler who can't keep out of debt to the mob. The confrontation with the woman in the bar, in fact, occurs only minutes after he has paid off one "shylock" loan to an L.A. gangster -- a man Cosmo has the nerve to call "a low life." It's Cosmo's reckless gambling that leads to the movie's key event: to erase his debt, Cosmo is directed to kill a Chinese organized crime boss, the "bookie" that gives the film its title. He is provided with a pistol, a stolen car and precise instructions on how to execute the "hit." Everything goes wrong. Cosmo panics en route to the assignment and abandons the car on a remarkably empty L.A. freeway. He has difficulty buying the hamburgers he is supposed to use to throw off the bookie's guard dogs. He is seen by a witness during the assassination and has to kill two people making his getaway. In the process, he is wounded. The injury could be mortal, but the character is so ambivalent that we are never sure. In his last scene, standing in front of his pathetic nightclub, Cosmo's hand and side are covered with blood from his untreated gunshot wound. The protagonist would learn something from all this in a film less cynical: his enlistment as a hired killer would force him to critically assess his life, his gambling habit, his relationship to others. But that would be a pat solution to the puzzle posed by the film, and there is nothing pat about The Killing of a Chinese Bookie. All Cosmo takes from the experience is a reification of his own machismo and sense of himself as a macher. "You take, uh, uh, Carol, right?" he says. "(She's) a dingbat, right? A ding-a-ling. A dingo. That's what people think she is,'cause that's the truth they want to believe. But, uh, you put her in another situation, right? Put her in a situation that's tough. Stress. Where she's up against something, you'll see she's no fool." "Right. 'cause what's your truth... is my falsehood," he concludes. "What's my falsehood is your truth and vice versa." Despite his reference to the dancer, it is clear here that Cosmo is referring to himself: he seems a clown to those around him, but once he is forced to commit to his role as a killer, he adopts his new identity completely -- to the surprise and chagrin of the gangsters who forced him into the part in the first place. Unfortunately, this brief review makes the film sound more coherent than it actually is. 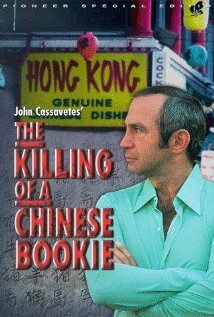 Cassavetes and Gazzara were exemplars of a school of dramatic arts that largely turns on improvised scenes and dialog, so the narrative flow of Chinese Bookie is fitful and chaotic. What the film lacks in narrative structure, however, it more than makes up in atmosphere. It also features performances by a number of world class heavies, playing the sort of petty villains they have specialized in throughout their careers. Seymour Cassel is terrific as Mort Weil, one of the Mafia hangers-on and one of the gangsters who genuinely seems to like Cosmo. Timothy Carey as Flo is perfect -- a stone psychopath who initially is fixated on Cosmo's $23,000 gambling debt, but kisses it off after Cosmo scores big by killing the Chinese bookie. There is also a great chase sequence in which Robert Phillips, who must have played bad guys in scores of movies during the 1960s and 1970s, nervously pursues Cosmo through a warehouse in an effort to kill him. And as a special bonus, Morgan Woodward, the boss guard who shot Paul Newman at the end of Cool Hand Luke, makes an appearance as the Mafia boss. One look at those cold grey eyes and I would agree to kill a Chinese Bookie, myself! A mixed bag, but I give The Killing of a Chinese Bookie three nooses.